When it comes to the world and the growth of population and industrialisation our attention rightly must turn to sustainability and the FEMB have taken steps to bring a greater understanding for the Office Furniture industries. The world has many environmental and sustainability schemes for office and non-domestic furniture, producing a confusing choice that will be helped tremendously by the introduction of the FEMB Standard and the European level-certification. Rather than add to the list of standards and certifications, they will provide an umbrella for the various European Country schemes. 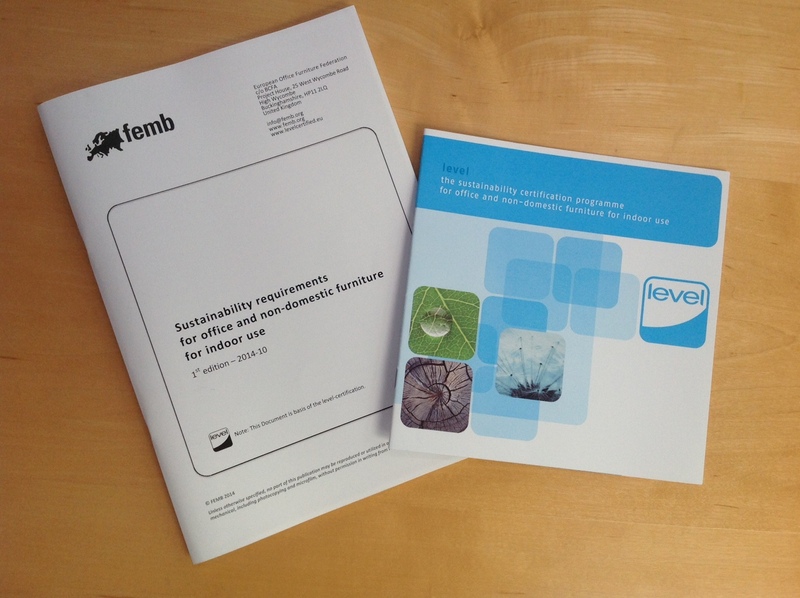 In order to face the proliferation of certifications schemes, labels and voluntary standards covering the environmental and social sustainability of furniture products, the FEMB decided in 2010 to adopt a proactive approach and start a process of harmonization existing material and provide a sustainability certification scheme of its own for Europe. The “level” certification programme, follows the experience gained by BIFMA in North America and proceeds along a similar path to provide a voluntary certification scheme, specifically designed to cover the environmental and social sustainability of companies products. The ANSI/BIFMA structure has been retained with specific needs of the European context taken into account. With the new FEMB certification, customers will be able to make informed choices about commercial furniture that exceed single attribute eco-certifications. As in the case of the BIFMA level certification, the new FEMB mark will identify that a product has been checked by an independent third party certifier. A numeric scaling from 1 to 3 will indicate what threshold of certification it has achieved. For manufacturers’ conformity to the FEMB standard will facilitate trade across geographic borders, will provide cost savings and will reduce wasted time and resources, usually needed to chase different requests from different national markets. For customers the FEMB standard and level certification will provide a reliable tool to compare the environmental and social impacts of furniture products coming from any country. Certification will start in 2015 with a number of companies already well advanced with their preparations level and the cooperation of BIFMA and FEMB is a long term programme with the objectives of simplicity, harmonization and constant improvement on sustainability. The new standard and level certification is a long term programme with the objectives of simplicity, harmonization and constant improvement on sustainability.